Growing up Lloyd in the 1950's I saw a lot of nice looking "Starlets" in many movies. Who become "A" List Actresses. There was Janet Lee, Natalie Wood all grown up, Eva Marie Saint, Carroll Baker, Sandra Dee, Debra Paget and that girl from "Altair 4" who knew her biology Ann Francis, but their movies didn't always appeal to a boy between six and fourteen. However, when I saw a trailer for a film with Peggie Castle, Allison Hayes, or Gloria Talbot in them. I did everything I could to get my parents to let me go to these low budget "B" films by the likes of Roger Corman, William Castle and Bert I. Gordon, because they were fun and usually imaginative. So here's a toast to the "Three Sisters of 1950's Science Fiction and a Little Horror". A time when we really didn't know what was out there, or what Atomic Radiation really did. Besides who cared we were having fun with our runaway imaginations. This article will give my reader a brief biographical sketch of each of the "Three Sisters", but it's those terribly cheap motion pictures they starred in that am I looking at. Did I say cheap? Some were actually made over a weekend and most of the money went to publicity. However, to that youthful Walk-in Movie Theater goers, or Drive-in Theater, car load prices and load the trunk, loving group somebody had just named "Teenager" and their pre-teen followers. These motion pictures were Academy Award Winning Classics with such colorful titles as: "Fiend Without a Face", "Flying Disc Man from Mars", "War of the Satellites" and "Monster from Green Hell". She was born Peggie Blair in Appalachia, Virginia December 22, 1927. She would work in motion pictures and television under that name and also Peggy Castle and Peggy Call. She would be dead at the age of 45 from cirrhosis of the liver caused by extreme alcoholism on August 11,1973. During Peggy Castle's short life she married four times, had one daughter and left an impression on me in two motion pictures. Don't let the titles completely type cast Peggie Castle as she also had substantial roles in films like Betty Davis' film "Payment on Demand" and the original version of the Mickey Spillane's Mike Hammer classic "I, the Jury" in 1953. On television Peggie Castle appeared on 12 different shows including one about the character of Mike Hammer. 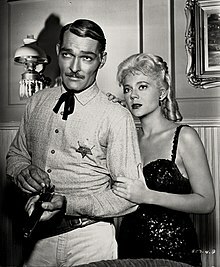 However starting with the second season of television's "Lawman" starring John Russell as Marshal Dan Troop. Castle found her role and would appear in 105 consecutive shows as the Saloon Owner and girlfriend of Troop Lilly Merrill. Below is the poster for a double bill I saw in December of 1952 at the ancient age of six, but one of these two films somehow stuck in my mind and when I saw it again on television many years later I remembered why. It was scary for the time. The double bill poster shown below is a great illustration of a lost art form that could make the 62 minute extremely low budget motion picture "1000 Years from Now", re-released four years later as "Captive Women", seem a must see Science Fiction film at the time. In a post-apocalyptic New York City, three tribes of mutants (the Norms, the Mutates and the Upriver people) battle each other to survive. The movie I am interested in is the bottom half of this double bill "Invasion U.S.A.". "Invasion U.S.A.", a personal favorite, was the first movie to play off the idea that the Soviet Union is able to take over the country and what it would be like. Remember this was early "Cold War Paranoia America". Chuck Norris in 1985 used the same title and did his version as a cross between this film and 1984's "Red Dawn". 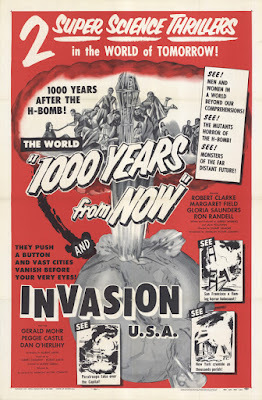 The 74 minute long"Invasion U.S.A.) had a very strong "B" cast lead by Gerald Mohr ("The Angry Red Planet), Peggie Castle and Dan O'Herlihy (the reptile alien navigator Grig in "The Last Starfighter). Of interest is that the movie featured both original film Lois Lane's. Noel Neill (both Columbia's serials "Superman" and "Superman vs Atom Man". Along with the first season of TV's "The Adventures of Superman". She would play Lois Lane's mother in the 1978 film "Superman". While playing Lois' father was Kirk Alyn the original Superman in those two Colombia serials). The other actress who would play Lois Lane was Phyllis Coates (TV's "The Adventures of Superman"). "Invasion U.S.A." is still considered by film historians of the Cold War Period a "Masterpiece" of paranoia fiction reflecting the mindset of American's at the time. A group of down on their luck people enter a bar and while there the unnamed Communist country attacks America and we follow each one's experiences in a solidly believable script. I really do not want to say more about this little gem and recommend that my readers take the time and watch it. Here is the link to the complete motion picture followed by some stills. The other film starring Peggie Castle that comes under this article is from low budget king Bert I. Gordon and co-starred Peter Graves and the ever present in 1950's Science Fiction stalwart Morris Ankrum ("Earth vs the Flying Saucers", "Invaders from Mars", "Rocketship X-M" and "Kronos" for starters). Peter Graves is a scientist trying to find a way to feed the world and is using a radioactive isotope to grow gigantic veggies. Unfortunately locust get into his greenhouse and the result are giants. "The Beginning of the End" opens with Peggie Castle's journalist accidentally finding a town in Illinois that has been totally destroyed and not one body is found. This leads her to Graves and his experiments. One of the funniest scenes in this movie which is considered one of the most poorly written and acted Science Fiction films of the 1950's has the locust claiming over large buildings. Unfortunately for the audience, but not Bert I. Gordon's budget. The large buildings are photographs and you laugh as the locust are half on the building and half in the air, or all in the air. As bad as the movie is the critics still point to its message of uncontrolled atomic experiments and there results. Also the stated time span for the locust to eat the radiated veggies and mutate make sense for a change. The motion picture is truly a poor man's "THEM" from three years earlier starring Peter Graves' brother James Arness. Peggie Castle's last appearance was on the television series "The Virginian" in the episode "Morgan Starr" which premiered February 9, 1966. She was credited 20 out of 22 cast members. Developed a chronic alcohol problem in the early 1960s. In 1969 she attempted suicide by taking an overdose of barbiturates and slashing her wrists. She was later committed to California's Camarillo State Hospital for her alcoholism, but she regressed after her release. A sad end for an actress I enjoyed as a young boy. Who apparently couldn't deal with the pressures of her profession and her life in general. Yet,like some of those "Starlets" I mentioned at the start of this article will be remembered fondly by fans of 1950's Science Fiction, which still spans all age groups, and those who love the low budget ridiculousness of Bert I. Gordon's films. On March 6, 1930 the next of my "Three Sisters" was born as Mary Jane Hayes in Charleston, West Virginia. 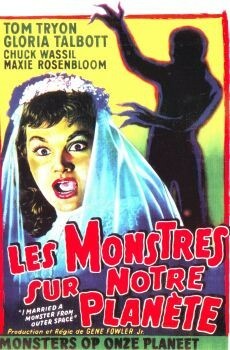 She would be known to the fans of 1950's Science Fiction and Horror as "Allison" Hayes. Allison like Peggie would die young only one year older than the other at 46. Unlike the star of "Invasion U.S.A." Mary Jane "Allison" Hayes had fought a loosing fight with leukemia, or possibly lead poisoning which had its final round on Sunday February 27, 1977. The reason the possibility of lead poisoning was considered by the coroner had to do with Hayes taking a calcium supplicant for years. Hayes had a toxicologist test the supplement and he discovered large quantities of lead in it. Actress Allison Hayes had been heading a major campaign to have the Food and Drug Commission (FDA) ban the supplement. The following link is to the introduction for: Martin W. Davis' book: "Consumer's Guide to Dietary Supplements and Alternative Medicines" The Hawworth Press in 2006. I advise you to read these three pages about the tragedy of Mary Jane "Allison" Hayes and her battle with lead poisoning and what the FDA still does not do today. Allison Hayes would leave a legacy of classic low budget Horror and Science Fiction films which she always approached as if they were equal to the "A" motion pictures of the large studios. At least one of her films is probably as well known as some of the so-called major films. Allison's movie career consisted of 26 feature films of which all four of her films for 1957 are considered, in their own ways, examples of classic 50's style low budget Horror and I will be discussing them shortly. Allison would also appear and in some instances more than once on 37 different television shows. Her short career was extremely productive and the actress was well liked. Allison Hayes first motion picture role was in the Donald O'Connor comedy "Frances Joins the Wacs" released July 30, 1954 This was the 5th film about Francis the talking mule who would be turned into a horse for television's "Mr, Ed". Hayes was billed 8th and some of the other ladies in the film are interesting to note. The two main female actresses were Julie Adams ("Creature from the Black Lagoon") and Maine Van Doorn (the poor man's Marilyn Monroe). Also in the cast was 40's actress Lynn Bari and billed 9th Marla Corday ( 1955's "Tarantula" and in 1957 "The Giant Claw" and "The Black Scorpion").. Released on December 18,1954 Allison Hayes had a major role in what unfortunately became a minor historical epic from Universal Pictures "The Sign of the Pagan". The film had a strong cast with Jack Palance as Attlia the Hun, Jeff Chandler as the Roman Centurion he is up against, Jeff Morrow ("This Island Earth", "The Giant Claw" and "Kronos"), Eduard Franz ("The Thing from Another World" and "The Four Skulls of Jonathan Drake") and Michael Ansara (the movie "Voyage to the Bottom of the Sea", "Star Trek", "Deep Space Nine" and "Babylon 5") also in the motion picture. Hayes played Iidico the seductive women who becomes the lover of Attila, but kills him in the end. The role by Allison Hayes was recognized by critics as excellently portrayed and had "The Sign of the Pagan" been. made one of the "major" studios Allison Hayes' future might have been different. However, the timing for this film was apparently wrong and the cast in this film were comparatively unknown "B" Actors. Adding also that Universal Pictures wasn't known for "A" pictures which this certainly might be considered compared to their other 1950's releases. Universal spent a lot of money on the production which does show on the screen including using the CinemaScope process that 20th Century Fox had only introduced the previous year.The movies that were nominated for Oscars in 1954 also reflect the bad timing of what is a good film. They were "On the Water Front", "The Caine Mutiny", "The Country Girl", "Seven Brides for Seven Brothers" and "Three Coins in the Fountain". The Best Actor and Actress categories also reflected on the timing with nominees from the following additional films. "A Star is Born", "Adventures of Robinson Crusoe", "Carmen Jones" "Sabrina" and "Magnificent Obsession". Nine more forgotten films followed "The Sign of the Pagan" and we come to 1958 and the four motion pictures which established Allison Hayes as one of the Queens, if not "THE" Queen of 1950's Horror. Made for Columbia Pictures by producer Sam Katzman and available on the "Icons of Horror: The Sam Katzman Collection" Allison Hayes had third billing in "Zombies of Mora Tau". This is a Zombie movie the way Zombies originally were shown until "The Night of the Living Dead" changed things. On the Island of Mora Tau off the African Coast are Voodoo style walking dead. In this particular case a group of sailors from 60 years before the film takes place cursed to guard a treasure in diamonds. Allison Hayes plays Mona Harrison one of the treasure seekers and the seductive wife who before the film's end has also been turned into one the walking dead. As cheesy by today's standards as this film appears it is actually good. The story makes sense, but when you're working on a Sam Katzman film ("The Creature with the Atom Brain" and "The Giant Claw") do not expect high production values. In several of his films Katzman made Roger Corman look like Martin Scorsese, but Katzman had the talent to pull these stories off and make them enjoyable to his pre-teen and teen target audiences in 1957. "Talent-less"? Maybe he considered Allison Hayes and Morris Ankrum in that category, but their places in 1950 Science Fiction and Horror Motion Picture History are well established. 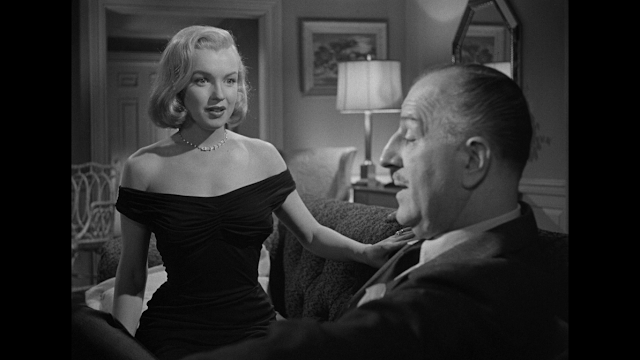 Next in 1957 Allison Hayes became a part of "The Unearthly". Before I talk about the plot the background on the film is interesting. The idea was originally for a movie by Ed Wood, Jr. who wrote the first script draft and created the characters. Then Russian born Boris Petroff ("Two Lost Worlds" from 1951 with James Arness) using the name Brooke L. Peters produced and directed this film for "AB-PT" Pictures. Actually those initials stood for the newly formed motion picture arm of televisions "The American Broadcasting Company (ABC)". The actual motion picture would be released by Republic Pictures on June 28, 1957. The film was completed in six days in May of 1957 and was on a double bill with Peggie Castle's "The Beginning of the End". John Carradine is experimenting on patients with artificial glands in an attempt to extend life. He gets his subjects from another doctor and one of them is Grace Thomas played by Allison Hayes. She is seeking treatment for depression. Eventually she will be saved from experimentation by Myron Healey's (the Americanized version of Toho Studio's "Varan the Unbelievable" and "The Incredible Melting Man") escaped convict. The police arrive and find a basement full of monstrosities created by Carradine in his failed experimentation. Allison Hayes moved up a step for her next feature produced and directed by Roger Corman called "The Undead". Pamela Duncan (Corman's "Attack of the Crab Monsters") plays prostitute Diana Love who in a past life was Helene a women from the middle ages. Val Dufour (the soap opera "Search for Tomorrow" from 1972- to 1979) plays Quintiss Radcliff a psychic who sends Diana back in time to relive her past life. There she will meet the witch Livia played by Allison Hayes. The movie was suppose to be something entirely different than shot. When the idea was first brought up reincarnation was very popular, because of the 1952 book "The Search for Bridey Murphy" by Morey Bernstein. 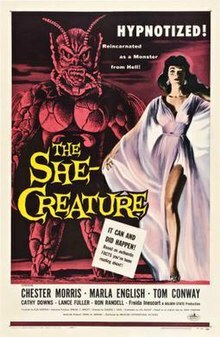 The year before Corman's film producer Alex Gordon for American International Pictures released "The She Creature" which also dealt with sending a women back in time under hypnosis. However, a year can make a difference and reincarnation as such didn't have the draw. So Corman came up with a sort of time travel angle and has Quintiss also go back to the middle ages to convince Helene that she must die to keep time in place. Two other production notes are of interest. The bats used in the film are actually the bat creatures from Roger Corman's "It Conquered the World" and the entire motion picture was another six day wonder actually shot entirely within a Supermarket. Here's a link to the complete motion picture "The Undead". The fourth film featuring Allison Hayes in 1957 seemed to follow a pattern for her. First she became a Zombie. Then she was "Unearthly" and next "Undead". Now she was "The Disembodied". One forgetful 1958 secret agent film "Hong Kong Confidential" later with Gene Barry and we come to the motion picture most associated with Allison Hayes. The original "Attack of the 50 Foot Women" and its high camp value. The movie could be considered the distaff version of Bert I. Gordon's "The Amazing Colossal Man" from 1957. Gordon's sequel to his film "War of the Colossal Beast" would be released the month after this motion picture. However, this film was produced by Bernard Woolner one half of the Woolner Brothers. They brought the 1950's movie viewer many a dubbed Italian film such as Mario Bava's "Hercules in the Haunted World" with a badly dubbed Christopher Lee and Mario Bava's "Blood and Black Lace" with Cameron Mitchell. Mark Hanna wrote the screenplay as he did "The Amazing Colossal Man". The plot for "The Attack of the 50 Foot Women" tells the viewer and especially husbands what would happen if they cheated on their wife. Allison Hayes plays Nancy Fowler Archer a recent release from a sanatorium for mental illness. Who while driving along on a deserted California highway in the desert has an encounter with a giant alien being. Who turns her into the 50 Foot women of the title that seeks revenge on her husband Harry Archer played by William Hudson. He was also in both "The Amazing Colossal Man" and the aforementioned "The She Creature". This motion picture ends with the Sheriff killing Nancy as a result of his firing a riot gun at a transformer. In her hand the Sheriff finds the dead Harry. The movie had a budget of $89,000 and on its initial United States release grossed $480,000. It was directed by Nathan H. Juran who among his credits included Ray Harryhausens' "20 Million Miles to Earth", "7th Voyage of Sinbad"and "First Men in the Moon". Juran was not unfamiliar with low budget quickie made films as he also directed such classics (?) as "The Deadly Mantis", "The Brain from Planet Arous" and 1962's "Jack the Giant Killer" with special effects by Jim Danforth. HBO did a remake of "The Attack of the 50th Foot Women" in 1993 with Daryl Hannah. The 1987 TMNT cartoon episode "Attack of the 50 Foot Irma" (1989) includes a similar plot, where April's friend Irma is hit by a beam, created from a meteorite crashing to Earth, and turns into a giant woman and ends up chased by the authorities. Planet 51 makes a reference: when the military police were going through books on how to treat aliens there is a book stating "Invasion of 50ft Women. Clips from the movie are spoofed in the music video for Neil Finn's 1998 single "She Will Have Her Way". Various animated television series have referenced the film, usually in episodes which involve a female character becoming giant-sized. For example, Challenge of the Superfriends from 1978 features the origins of superhero Apache Chief and supervillainessGiganta. The TV sitcom Night Court referenced the movie when the attorney Dan Fielding is approached by a defendant, a tall and imposing female circus performer; intimdated, he retreats to ask two other characters if they'd seen that movie. Various Clips from the movie were featured in the original opening sequence of WPIXs Chiller Theatre in the 1960s, including the classic goof where one brand of car is picked up by the giant alien and another brand of car, apparently a "Woody" is thrown into a ditch. Terry Pratchett's "Discworld" book Moving Pictures climaxes with a giant, 50 foot woman carrying a screaming ape up a tall tower. This is also an inversion of the ending of King Kong, with flying wizards on broomsticks taking the place of the aeroplanes. The film was also homaged in Marvel Adventures: The Avengers#13, a story entitled Attack of the Fifty-Foot Girl!, spotlighting Avengers member Giant-Girl. the cover of this issue was also based upon the movie's poster. The 2004 PlayStation 2 videogame The Daibijin (The Gigantic Beauty) faithfully follows the film's original premise when japanese idol Riho Futaba becomes a giantess after being attacked by a crab-like alien. In the episode of Johnny Bravo "Jumbo Johnny", the film was shown in a cinema while 2 guys complained about it before Johnny squished them. In the 2009 film Monsters vs. Aliens, Reese Witherspoon's character Susan Murphy (aka Ginormica) was inspired by this film. Ginormica was, originally, exactly 50 feet. In the 1988 cult classic film Saturday the 14th Strikes Back, the oldest sister Linda Baxter, played by Julianne McNamara, becomes a 50 foot woman and is stuck inside her house. An episode of Totally Spies! titled "Attack of the 50 Foot Mandy" features Mandy as a giantess. The episode also features a scene that closely resembles the movie poster from Attack of the 50 Foot Woman. But however she ends up getting eliminated at the end of the episode. In the special of "Total Drama Action" titled "Celebrity Manhunt's Total Drama Action Reunion Special" shows a poster with Izzy parodying the titular character. An episode of "Spongebob Squarepants" named "Giant Squidward" shows Spongebob and Patrick turning Squidward into a giant. The cover of a 2010 Mother Jones issue parodies the movie by depicting Sarah Palin as the titular character. An episode of Archie's Weird Mysteries titled "Attack of the 50 Foot Veronica" features Veronica Lodge as a giantess. The album The Completion Backward Principle by The Tubes has a song called "Attack of the Fifty Foot Woman". The album You Have No Idea What You're Getting Yourself Into by Does It Offend You, Yeah? has a song called "Attack of the 60 Foot Lesbian Octopus". In a 2012 Elle magazine spread featuring television actresses portraying horror movie characters, Glee co-star Dianna Agron posed as the 50 Foot Woman. The opening track of the 2012 Album Bang! Is This Your Vehicle Sir? by British songwriter and comedian, Boothby Graffoe (comedian), is entitled "Attack of the 50 Foot Woman" and consists of a comic account of the film. Allison's next movie is interesting if for no other reason then it was the first motion picture with Hollywood Actors filmed in Canada. The movie was created 40 years before subsidies from Telefilm Canada would begin to enable Canadian film makers to use American actors and we know what has resulted to the U.S. Film Industry from that decision. The movie was unseen for 50 years, but here is a link to it for those who might be interested in seeing this little film starring Jim Davis and Allison Hayes. The motion picture was shot in Markdale, Ontario, Canada and used a large portion of that communities actual residents in roles withing the motion picture. The plot has ex-convict Jim Davis returning to his wife and son to start anew. However, some local residents still resent him. This movie is also interesting in that Allison Hayes plays the loyal wife and mother. A film role out of character for her and I am sure one of the reasons she accepted it. is Hill that has been attempting to kill him and is the real crime boss. Westerns and also "B" Western motion pictures. Over her career Talbott would appear in 15 movies of which eight were those "B"
in, but just the program names. Life and Legend of Wyatt Earp" starring Hugh O'Brien. her guardian who wants to use Superman in a scheme he has come up with. develops between Talbott and Sernas as they use the future information. the Secretary of the Treasury on the bill is his. Moving ahead we come to the first of those four Science Fiction/Horror films. Bert I. Gordon was in the giant business with split screens and rear projections. films released by Allied Artists.but made by different producers. typical Bert I. Gordon entry. Below Bert I. Gordon at the 2006 "Monster Bash" in Pittsburgh, Pennsylvania. Cyclops" and Right as "The Colossal Beast"
"THE DAUGHTER OF DR. JEKYLL"
a 1951 motion picture starring actor Louis Hayward. co-star John Agar hated this film. (See my biography of John Agar on this blog). and starts to believe she has a split personality turning her into a female Hyde. However she is not the real killer. Proving you don't trust your shrink. for Gloria Talbott as her other self. in October 1958 by Paramount Pictures. by an Alien from a planet without females attempting to save his species. eventually the aliens are defeated and the human men returned to their wives. named Steve McQueen entitled "The Blob". youth except that she became the title character as a result. royal jelly from a queen wasp to keep herself young and beautiful by becoming "The Wasp Women". Coleen's Gray's ("The Vampire" and "The Phantom Planet") "Leech Women" uses the pineal gland secretions from men she kills. She makes the mistake of using a women's pineal gland instead and ages rapidly. Gloria Talbott played the girlfriend of a young man played by Grant Williams ("The Incredible Shrinking Man" and "The Monolith Monsters") that Gray's character is in love with. So she kills Talbott thinking it will make him easier to get. For the next six years Gloria Talbott returned to television work. Some of the other television programs she would appear on during this period included classic 1960's shows such as "Dr. Kildare", "Surfside 6", "The Untouchables" and "Perry Mason", but her mainstay was still Westerns. She would appear on "Wagon Train", "Laramie", "Gunsmoke", "Death Valley Days", "Tales of Wells Fargo" and "Rawhide". Among other's forgotten today like "Bronco", "Frontier Circus" and "The Littlest Hobo". Gloria Talbott's last appearances were in two Westerns naturally. The first was Audie Murphy's "Arizona Raiders" in 1965 and in 1966 she appeared in "An Eye for an Eye" starring Robert Lancing, Patrick Wayne and Slim Pickens. Three years later Gloria Talbot divorced her third husband Dr. Steven J. Capabianco and in 1970 married Dr, Patrick Mullally. Who was with her when she passed away. There were other "Scream Queen's", but looking at the 1950's these three actresses led the group and in the following decade new one's would appear such as Janette Scott, Barbara Steele and Hazel Court.